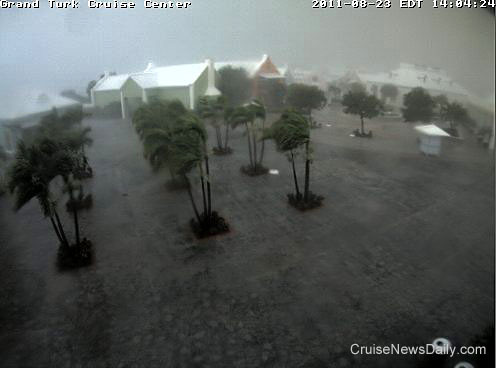 Hurricane Irene passed by Grand Turk this afternoon about 2pm. While the eye was still approximately 40 miles to the south, it’s estimated that the island was experiencing winds of about 90 mph. 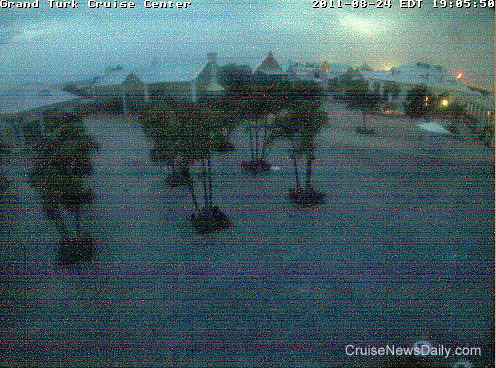 That closed the Grand Turk Cruise Center until further notice, but they left their webcam on. The photo above was snapped at 2:14pm when the storm should have been at its height. Amazingly the communication link remained up until 3:44pm. The back edge of the storm passed by early Wednesday afternoon, and the webcam came back up Wednesday evening. As you can see, in the photo above, taken at 7:05pm, there is no visible damage to the facility. Carnival says the Cruise Center should be open in time for the next scheduled operation, Carnival Miracle, which arrives on Monday morning. Germany, with a gateway in Hamburg, has become a market with growing importance to Cunard, and the city always seems anxious to see the Cunarders when they are in port. These short clips show Queen Mary 2 departing from Hamburg earlier this month, its twentieth visit to the German port. In the clips, you can see some of the thousands lining the banks of the Elbe to see the ship. Just a moment of Zen.